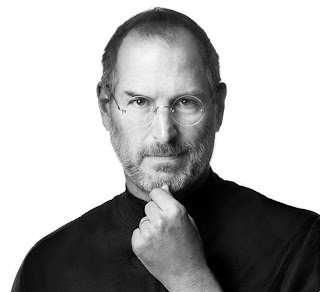 Rural Tamilnadu Photography: Steve Jobs...Stay Hungry Stay Foolish..
Steve Jobs...Stay Hungry Stay Foolish.. It was January 1984 and a floppy haired Steve Jobs, in a suit and striped bow tie stood on stage in front of some 3,000 people. With a flourish he took the cover off the beige box computer that now looks laughingly quaint but back then provoked applause, squeals and gasps. The applause grew as he inserted a floppy disk, people whooped as he showed off its applications: painting pictures on screen; playing chess. It reached almost deafening levels after the Macintosh, speaking in a monotone, introduced its “father” - a beaming Steve Jobs. Jobs had a kind of showmanship rarely seen; showmanship that was repeated again and again: whether it was the 1998 launch of the iMac, the 2007 launch of the iPhone, or the 2010 launch of the iPad. His childlike enthusiasm and sincere passion for the product he was unveiling, combined with a gentle sense of humour (calling up a Starbucks to order 4,000 coffees during the iPhone unveiling is just one example) left people hooked to him and his products. To Jobs, not being a plain vanilla technology man was an advantage: it gave him a perspective that many lacked in the industry – an ability, as he saw it, to connect experiences to create something new. During a Commencement Address delivered at Stanford University in 2005, he spoke of the moment when, after dropping out of Reed College, he did a short calligraphy course, where he learnt what makes “great typography great.” That knowledge, useless to him at the time, came in handy during the creation of the Macintosh, which he described as the “first computer with beautiful typography.” That ability to connect the dots was seen over and over again over the years: as it was with the iPod. There were MP3 players out there but it took a Jobs and his company to marry it with iTunes. It was why the revolutions he triggered weren’t limited to the world of computing but were spread to telecom, music, and movies. Jobs listened to what people wanted: during the launch of the iMac he told his audience “We are targeting this for the No. 1 use that people want a computer for: to get onto the Internet simply and fast.” He was spot on. Quite what he meant to the company became clear when he left following a row with CEO John Sculley. The company floundered until his return in 1997 – which was shortly followed by the successful launch of the iMac. Those out-of-Apple years weren’t a low point for him though: he bought Pixar Animation Studios, which made Toy Story and film after film that brought animation into the digital age (connecting the dots once again). He sold it to the Walt Disney Company for $7.4 billion in 2006. Compared with his ability to magic desires people didn’t know even know they had, Jobs’ business acumen often receives little attention but it was there in heaps. The strategy of planned obsolescence, such as the camera-less first iPad – may have exasperated many fans, but certainly didn’t prevent them from crowding his stores, or buying his upgrades. Neither does the military-like-discipline with which the company runs and extracts revenues from its App store, and all the applications that make their way on it. During the third quarter of this year, Apple stores had an average of 2,491 visitors a day.